Satanta (properly Set-t‘aiñ'-te, 'White Bear'). For about 15 years before his death he was recognized as second chief in his tribe, the first rank being accorded to his senior, Setängyä, or Satank, and later to Lone Wolf, although probably neither of these equaled him in force and ability. His eloquence in council gained for him the title of "Orator of the Plains," while his manly boldness and directness and his keen humor made him a favorite with army officers and commissioners in spite of his known hostility to the white man's laws and civilization. He was one of the signers of the Medicine Lodge treaty of 1867, by which his tribe agreed to go on a reservation, his being the second Kiowa name attached to the document. The tribe, however, delayed coming in until compelled by Custer, who seized Satanta and Lone Wolf as hostages for the fulfillment of the conditions. For boastfully avowing his part in a murderous raid into Texas in 1871, he, with Setangya and Big Tree, was arrested and held for trial in Texas. Setangya was killed while resisting the guard. The other two were tried and sentenced to life imprisonment in the Texas State penitentiary. Two years later they were released, conditional upon the good behavior of their people, but in the fall of 1874, the Kiowa having again gone on the warpath. Because of his participation in continued raids in southwestern Kansas, southeastern Oklahoma, New Mexico, and Texas, Chief Satanta was arrested and imprisoned on three separate occasions. On October 11, 1878 while serving out a life sentence in a prison in Huntsville, Texas, he complained of an injury or that his "heart was bad" (there is some disagreement which) to the prison physician. 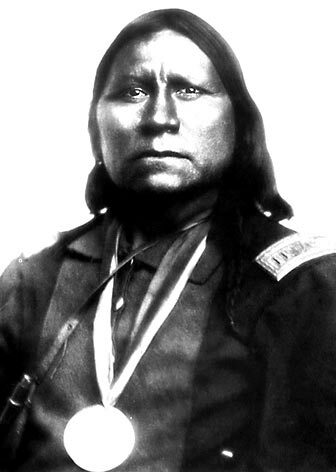 He was taken to the prison hospital on the prison's second floor, but before treatment could be given the erie chant of the Kiowa death song was heard as Satanta plunged headfirst from the second-story balcony to the ground below, ending his long resistence to the white man's injustice to his people. In appearance Satanta was a typical Plains warrior, of fine physique, erect bearing, and piercing glance. One who saw him in prison in 1873 describes him as "a tall, finely formed man, princely in carriage, on whom even the prison garb seemed elegant," and meeting his visitor "with as much dignity and grace as though he were a monarch receiving a foreign ambassador." 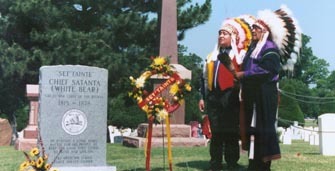 His memory is cherished by the Kiowa as that of one of their greatest men. The most famous of the frontier outlaws, did time in the Texas State Penitentiary at the Huntsville “Walls” prison. Old West outlaw and gunslinger John Wesley Hardin was born May 26, 1853, in Bonham, Texas. Rumored to be so mean he once shot a man for snoring, Hardin was shot to death in El Paso on August 19, 1895, by a man he had hired to kill someone else. John's father, James G. Hardin, was a Methodist preacher, lawyer, schoolteacher and circuit rider. His mother was Elizabeth Hardin. At age fourteen, John stabbed a schoolmate. At age fifteen, he shot a black man to death in Polk County. While fleeing from the law following that murder, he killed at least one, and possibly four Union soldiers who were attempting to apprehend him. As a cowboy on the Chisolm Trail in 1871, Hardin killed seven people. He killed three more upon arriving in Abilene, Kansas. Back in Texas, following a run-in with the State Police back in Gonzales County, Hardin got married, settled down and had three children. But he soon resumed his murder spree, killing 4 more times before surrendering to the Cherokee County sheriff in September 1872. He broke out of jail after a couple of weeks, however. Hardin next killed Jack Helm, a former State Police captain, who led the fight against the anti-Reconstructionist forces of Jim Taylor in the Sutton-Taylor Feud. Hardin had become a supporter of Taylor's from 1873 to 1874. In May 1874, Hardin killed a deputy sheriff in Brown County while visiting the town of Comanche. Fleeing to Florida with his family, Hardin was captured by Texas Rangers in Pensacola on July 23, 1877. During that flight, he killed at least one, and perhaps as many as five more victims. On September 28, 1878, Hardin was sentenced to twenty-five years for the Brown County deputy's murder. He was pardoned on March 16, 1894. Having studied law while in prison, Hardin was admitted to the Texas bar soon after his release. 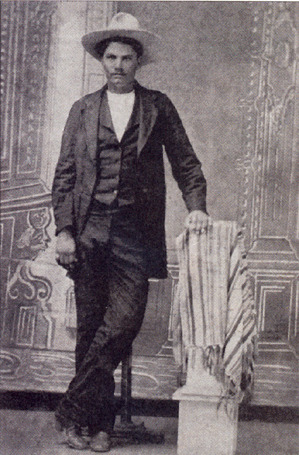 In 1895, Hardin went to El Paso to testify for the defense in a murder trial. Following the trial, he stayed and established a law practice. Just when he seemed to finally be going straight, Hardin began an affair with one of his married female clients. Her husband found out about the affair and Hardin hired some law officials to kill him. One of the hired gunmen, however, Constable John Selman, shot Hardin instead. Legend has it that his last words were, "Four sixes to beat, Henry." When killed, Hardin was shooting dice with local furniture dealer Henry Brown at the Acme saloon in El Paso. Thus ended the life and career of one of Texas deadliest gunslingers. Despite his killing of over thirty people, Hardin had a reputation as a gentleman among those who knew him, and he always claimed he never killed anyone who didn't need killing. Bibliography: Wendy Brabner, ed., Texas Monthly Texas Characters Datebook 1985 (Austin, Texas: Texas Monthly Press, 1984). Ron Tyler, ed., The New Handbook of Texas, Vol. 3 (Austin, Texas: Texas State Historical Association, 1996) pp. 454-55. The two outlaws, and lovers died in a hail of gunfire 75 years ago this month. 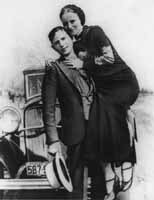 Clyde Champion Barrow and his companion, Bonnie Parker, were shot to death by officers in an ambush near Sailes, Bienville Parish, Louisiana, on May 23, 1934, after one of the most colorful and spectacular manhunts the Nation had seen up to that time. Barrow was suspected of numerous killings and was wanted for murder, robbery, and state charges of kidnaping. The Federal Bureau of Investigation (FBI), then called the Bureau of Investigation, became interested in Barrow and his paramour late in December, 1932, through a singular bit of evidence. A Ford automobile, which had been stolen in Pawhuska, Oklahoma, was found abandoned near Jackson, Michigan in September of that year. At Pawhuska, it was learned another Ford car had been abandoned there which had been stolen in Illinois. A search of this car revealed it had been occupied by a man and a woman, indicated by abandoned articles therein. In this car was found a prescription bottle, which led Special Agents to a drug store in Nacogdoches, Texas, where investigation disclosed the woman for whom the prescription had been filled was Clyde Barrow's aunt. 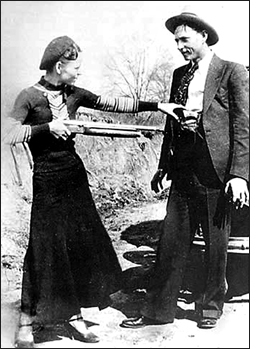 Bonnie and Clyde met in Texas in January, 1930. At the time, Bonnie was 19 and married to an imprisoned murderer; Clyde was 21 and unmarried. Soon after, he was arrested for a burglary and sent to jail. He escaped from the Eastham prison unit in Texas using a gun Bonnie had smuggled to him, was recaptured, and was sent back to prison. Clyde was paroled in February, 1932, rejoined Bonnie, and resumed a life of crime. In addition to the automobile theft charge, Bonnie and Clyde were suspects in other crimes. At the time they were killed in 1934, they were believed to have committed 13 murders and several robberies and burglaries. Barrow, for example, was suspected of murdering two police officers at Joplin, Missouri, and kidnaping a man and a woman in rural Louisiana. He released them near Waldo, Texas. Numerous sightings followed, linking this pair with bank robberies and automobile thefts. Clyde allegedly murdered a man at Hillsboro, Texas; committed robberies at Lufkin and Dallas, Texas; murdered one sheriff and wounded another at Stringtown, Oklahoma; kidnaped a deputy at Carlsbad, New Mexico; stole an automobile at Victoria, Texas; attempted to murder a deputy at Wharton, Texas; committed murder and robbery at Abilene and Sherman, Texas; committed murder at Dallas, Texas; abducted a sheriff and the chief of police at Wellington, Texas; and committed murder at Joplin and Columbia, Missouri. Ivan M. "Buck" Barrow, brother of Clyde, was released from the Texas State Prison on March 23, 1933, having been granted a full pardon by the Governor. He quickly joined Clyde, bringing his wife, Blanche, so the group now numbered five persons. This gang embarked upon a series of bold robberies which made headlines across the country. They escaped capture in various encounters with the law. However, their activities made law enforcement efforts to apprehend them even more intense. During a shootout with police in Iowa on July 29, 1933, Buck Barrow was fatally wounded and Blanche was captured. Jones, who was frequently mistaken for "Pretty Boy" Floyd, was captured in November, 1933, at Houston, Texas, by the sheriff's office. Bonnie and Clyde went on together. The FBI had jurisdiction solely on the charge of transporting a stolen automobile, although the activities of the Bureau Agents were vigorous and ceaseless. Every clue was followed. "Wanted notices" furnishing fingerprints, photograph, description, criminal record, and other data were distributed to all officers. The Agents followed the trail through many states and into various haunts of the Barrow gang, particularly Louisiana. The association with Henry Methvin and the Methvin family of Louisiana was discovered by FBI Agents and they found that Bonnie and Clyde had been driving a car stolen in New Orleans. On April 13, 1934, an FBI Agent, through investigation in the vicinity of Ruston, Louisiana, obtained information which definitely placed Bonnie and Clyde in a remote section southwest of that community. The home of the Methvins was not far away and the Agent learned of visits there by Bonnie and Clyde. Special Agents in Texas had learned that Clyde and his companion had been traveling from Texas to Louisiana, sometimes accompanied by Henry Methvin. Story assembled from several sources, libraries, and news agencies. The 'Texas 7' was a group of prisoners who escaped from the John Connally Unit near Kenedy, Texas on December 13th, 2000. They were not apprehended until January 21st-23rd, 2001. ★ Patrick Henry Murphy, Jr.
On December 13, 2000, the seven carried out an elaborate scheme and escaped from the John B. Connally Unit, a maximum-security state prison near the South Texas town of Kenedy. Ultimately driving out in a white prison truck, they managed to seriously embarras the warden, because modifications in prison security procedures might have prevented the escape plan's success. At the time of the breakout, the reported ringleader of the Texas Seven, 30-year-old George Rivas, was already serving 18 life sentences. Michael Anthony Rodriguez, 38, was also serving a life term, while Larry Harper, 37, Joseph Garcia and Patrick Murphy, Jr., 39, all were serving at least 50 years. Donald Keith Newbury, the member with the longest rap sheet of the group, was serving a 99-year term. The youngest member, Randy Halprin, 23, was serving a 30-year sentence for injury to a child. Using several well-planned ploys, the seven convicts overpowered and restrained nine civilian maintenance supervisors, four correctional officers and three uninvolved inmates at approximately 11:20 a.m. The escape occurred during the slowest period of the day when there would be less surveillance of certain locations like the maintenance area — during lunch and at count time. Most of these plans involved one of the offenders calling someone over, while another hit the unsuspecting person on the head from behind. Once the victim was subdued, the offenders would remove some of his clothing, tie him up, gag him and place him in an electrical room behind a locked door. Fourteen prisoners and uninvolved inmates were bound and gagged. The attackers stole clothing, credit cards, and identification from their victims. The group also impersonated prison officers on the phone and created false stories to ward off suspicion from authorities. After that, some of the group made their way to the back gate of the prison, some disguised in stolen civilian clothing. They pretended to be there to install video monitors. One guard at the gatehouse was subdued, and the offenders raided the guard tower and stole numerous weapons. Meanwhile, the offenders who stayed behind made calls to the prison tower guards to distract them. They then stole a prison maintenance pick-up truck, which they drove to the back-gate of the prison, picked up their cohorts, and drove away from the prison. The white prison truck was found in the Wal-Mart in Kenedy, Texas. The Texas 7 first went into San Antonio right after breaking out of the complex. Realizing that they were running out of funds, they robbed a Radio Shack in Pearland, Texas the next day on December 14 at around 2 AM. In order to bypass the otherwise-competent store security, they entered via a very small-scale adjacent computer software store, wherein they proceeded to knock down the flimsy sheetrock wall to the other side. Once inside and undetected, they tethered the Radio Shack safe to their truck, and literally drove the large safe outside of the building, causing havoc to the parking lot and pavement. On December 19, four of the members checked into an Econo Lodge motel under assumed names. They would plot out which target to hit next. They later decided to rob an Oshman's sports store in Irving, Texas. On December 24, 2000, they held up the store and stole many weapons. Irving police officer Aubrey Hawkins came to the scene, but was shot dead before the gang fled the scene. A $100,000 reward was then offered to whoever could snare the group of criminals. The reward would climb to $500,000 before the group was apprehended. Wayne Holder, the owner of the Coachlight Motel and R.V. Park in Woodland Park, Colorado, happened to watch the television program America's Most Wanted on January 20, 2001. He believed that the Texas 7, who were being compared to Angel Maturino Resendiz, were in his trailer park. When he confirmed this, he reported the suspicious activities to local authorities the next day on January 21. Colorado Springs Police Department SWAT Teams found three of the members, Garcia, Rodriguez, and Rivas, in a Jeep Cherokee in the RV park. Authorities moved in to capture them in a nearby gas station. They then found Halprin and Harper in an RV. Halprin surrendered peacefully, but Harper committed suicide with a pistol. The surviving four members were arrested. On January 23, they received information about the whereabouts of the last two. They were hiding out in a Holiday Inn in Colorado Springs, Colorado. A deal brokered between the two, Newbury and Murphy, allowed them to make live TV appearances before they were arrested. A local KKTV television anchorman, Eric Singer, was taken into the hotel where on camera he interviewed the two by telephone. Both of them harshly denounced the criminal justice system in Texas, with Newbury adding "the system is as corrupt as we are." Authorities later found out that a woman named Patsy Gomez conspired with a man named Raul Rodriguez to help the Texas 7. George Rivas was sentenced to death after being extradited to Texas. Since then, the other five surviving members of the Texas 7 have also been put on death row alongside Rivas, and are all awaiting death by lethal injection. Michael Anthony Rodriguez has announced that he would like to waive all appeals in order to hasten his death sentence. A court-ordered psychiatric evaluation ordered in January 2007 will determine if he is competent to waive all appeals.